I wanted to make a tasty treat to post to my boyfriend (in Argentina) for Valentine's Day. I posted him some of the Argentine Thumbprint Cookies that I made back in October and he absolutely loved them, as well as the idea of them being homemade and travelling so far. 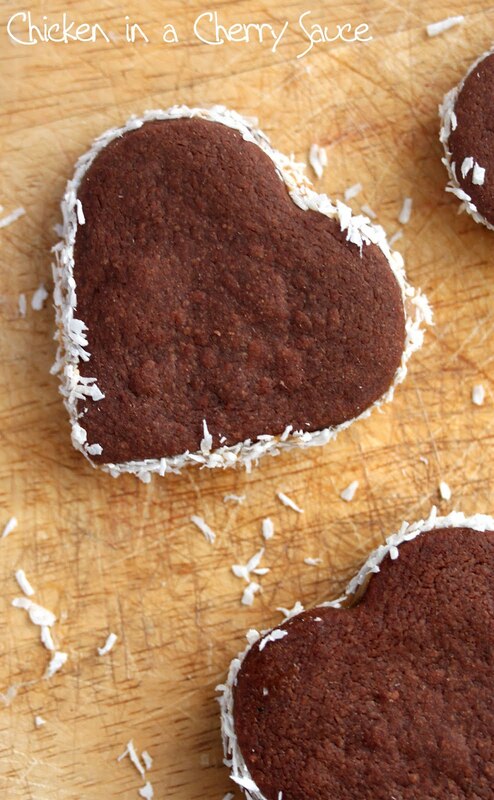 I decided that the Valentine's treat had to be heart-shaped and it had to be something small and light for the post. 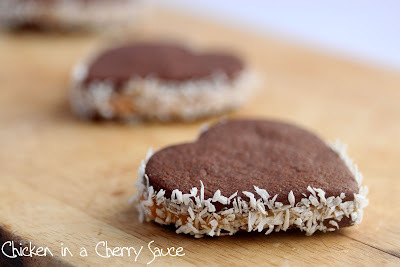 The Argentine Thumbprint Cookies were adapted from the traditional Argentine Alfajores (shortbread cookies sandwiched with dulce de leche and dusted with desiccated coconut), so I decided to make a Valentine's version of alfajores! I used the same recipe for the shortbread that I used for the Argentine Thumbprint Cookies (55g sugar creamed with 125g of butter with 180g plain flour), but substituted 20g of the flour for some cocoa powder to make them dark and chocolately. 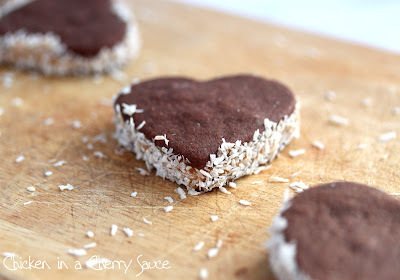 Shortbread is so simple to make and so delicious that is has become a favourite of mine! I rolled the shortbread dough (I ended up using an empty wine bottle as this student house seems to be a lacking rolling pin, as well as nutmeg, which I mentioned in my previous post!) and used a heart-shaped pastry cutter to cut out some hearts that were around 3mm thick. I then baked them at 180°C for around 10-12 minutes. 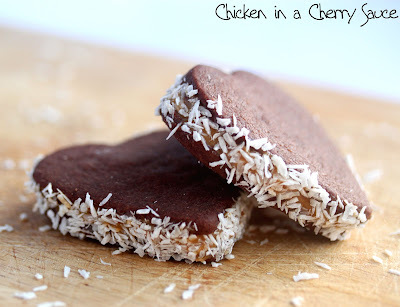 After they had cooled, I sandwiched them with dulce de leche and rolled the edges in desiccated coconut. I can only hope that they make it safely through the post and arrive on time! These are gorgeous! What fabulous flavors and what a lucky guy to get these in the mail. So sweet! I hope his first thought will not be 'Crumbs' when he opens them, they do look VERY good. Oh, those are so pretty and tempting! A great treat and Valentine's Day gift. Well that is real love. Such a lovely idea to think of those biscuits winging their way to Argentina. They look really pretty too with the lacy coconut edges. Hope they get there in one piece! Your boyfriend will love you for ever Hazel - how lovely and thoughtful to make these and send them to him. Fingers crossed they get there ok - it would be awful if he opens a box of broken hearts! I always mean to try alfajores but haven't got round to it yet - yours look awesome! This is so sweet! Your boyfriend must be touched with your sweet intention. Happy Valentine's Day! They are so cute, what a nice cookie. They look great - lovely thing to receive any day but especially on Valentine's day. You definitely met your goal of making something tasty for your boyfriend:) They look so beautiful too! How perfect are these....so cute. hey....its looking yumm n tasty.........u have an award in my space.plz accept it..